MeetingBooster enforces a higher level of meeting preparation, empowering organizations to run more effective meetings and deliver better results - every time. With integration to MS Outlook, meetings can be scheduled and invitations distributed using the organization's existing email client. Meeting information can be accessed through the MeetingBooster tab. Since users do not have to change their scheduling habits, MeetingBooster is easy to adopt into any organization with minimal training or resistance. For further efficiency, a web-based portal makes MeetingBooster's powerful online meeting scheduling tool accessible from any computer with an Internet connection. No need to look at complex calendar views to find meeting availability! MeetingBooster’s Conflict Resolver makes it easy by searching attendees’ calendars, identifying conflicts and suggesting alternative meeting times. Meeting agendas are critical for keeping meetings on track, but creating an agenda can be a time-consuming and tedious task. With MeetingBooster's Agenda tool, meeting organizers can create a structured agenda, add or modify topics, sub-topics, topic descriptions, topic time allotments, presenters and breaks. 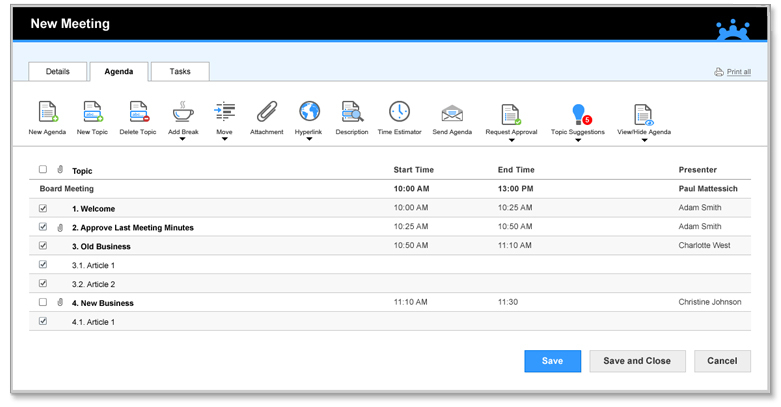 From your email client, quick links provide instant access to the Agenda tool where users can either create the agenda during the scheduling process or come back later to create, modify or finalize a meeting agenda. Since MeetingBooster is accessible from any computer with an Internet connection, users can also return to the agenda at any time to modify or finalize it. Agenda reminders are sent to meeting hosts prior to their meetings, thus ensuring that accurate and complete agendas are used at every meeting. Preparation is critical to the effectiveness of any meeting – and not just for the host. Attendees are often required to prepare documents, sales figures and other materials to bring to the meeting. MeetingBooster eliminates the need for meeting organizers to send reminder emails or make telephone calls to follow up on these requests. With MeetingBooster, they can simply assign preparation tasks during or after the scheduling process to ensure that everyone comes to the meeting prepared. Automated Task reminders relieve managers of the burden of continuously following up with task owners. When the meeting starts, task status is easily reviewed, thereby increasing accountability – every time.